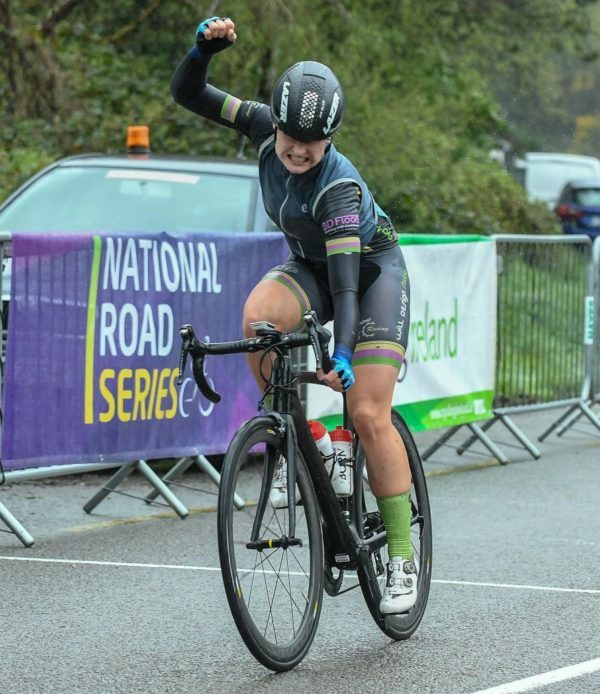 Mia Griffin has taken her first victory in the Cycling Ireland National Road Series, proving strongest of a breakaway at the Donal Crowley Memorial. Griffin (TC Racing) won it well; pulling clear with two of the very best riders in the country but seeing them off at the finish on a wet and hard day for racing. In the Blarney Cycling Club promotion, Eve McCrystal (Strata 3-VeloRevolution) was active from the start; showing the form that won her the national title last year and many of the other biggest road races in the country. And when the winning move went clear, in the opening third of the race, McCrystal was present. She had eventual winner Griffin for company, with international TT rider and former national champion Eileen Burns (Ballymena Road Club) with them. That made for very considerable firepower in the front group; Griffin less experienced than the other two but coming of a successful team pursuit season on the track. She has been part of the Irish team for the past 18 months that has ridden very well internationally and broken the long-standing Irish record. By the halfway point in the race, with the wet conditions showing no signs of clearing, the three leaders were two minutes to the good on the reduced peloton behind. And with just 25km remaining to the finish that gap had extended further, hitting three minutes. That meant the podium looked set in stone from a long way out, with just the order of it to be settled. Behind them the six strongest riders formed a chase group. It included Katharine Smith (Ballymena RC), Irish junior international Lucy O’Donnell (O’Leary Stone Kanturk) and Des Hanlon winner Grace Young. The latter was in an interesting position; keen to defend the series lead she took with her recent win in Carlow but with a team mate up the road in the shape of McCrystal. As predicted the three leads had an unassailable advantage and at the finish Griffin put in a great sprint to claim victory. She won by a couple of lengths from McCrystal, with Burns just behind in 3rd place. Young did her series chances no harm in taking 4th place on the day.